Your dog spends the day trying to ‘guilt’ you into feeding them. Canines adore food, and dinnertime is regularly the highlight of their day. So, why are so many dogs terrified of their food bowl? Dogs may be afraid of their plastic food bowl because it’s too large or it causes an allergic reaction. Or, perhaps they’re nervous about a metal food bowl that moves when nudged, feels cold to the touch, or makes a loud, clanging sound when placed on the ground. Dogs have an acute sense of hearing, so even a minor sound to us could be deafening for your pet. This article will take an in-depth look at the possible reasons why your dog is afraid of their food bowl, and of course, what you can do to make mealtimes altogether less frightening for your dog. 1.5 Why Does My Dog Push His Food Bowl with His Nose? 1.6 Why Does My Dog Cover His Food Bowl? 1.7 Why Does My Dog Tip Over His Food Bowl? 1.8 Should I Get My Dog an Elevated Bowl? Seemingly out of the blue, a dog refuses to eat from the food bowl that it had previously contentedly munched his or her meal from. This can be a strange behavior, and it’s fair to say that it’s a frustrating one at times. Maybe your dog takes food from their bowl and dumps it all over the floor, preferring to eat from there. Perhaps your dog has taken to following you around the house and whining, insisting that you feed them by hand. Strange smell. If your dog’s bowl has an unappealing smell, it will put your pet off their food. Consider changing dishwashing liquid and see if that helps. It hurts. Check your dog’s oral hygiene regularly – making a habit of brushing their teeth If your dog has a toothache or oral discomfort, then they may consider their food bowl to be the culprit. Somebody else has been there. Do you have other dogs or a cat? If so, they may have been helping themselves to a snack from your dog’s bowl, putting Fido off his food. They’re not comfortable with the location. Is your dog’s food bowl too close to the TV, meaning that it’s deafening? Is it located beside a cat’s bed or food bowl, leaving Fido fearing a swipe from a feline paw? Is it near a wall that is damp, meaning that the area smells odd? Any of these could be among the explanations for your dog avoiding their bowl. They want what you’re having. Some dogs feel so much like part of the family that they’re indignant at the idea of eating their food from a bowl while you’re seated at a table with a plate. Try sprinkling a small amount of dog-friendly food from your plate into their meal. Attention. It’s possible that your dog likes the attention that refusing to eat from their bowl brings them. No dog will willingly go hungry, so try placing your dog’s food down for thirty minutes and taking it away if they won’t eat. Put it back an hour later, and you may be surprised at how quickly your dog decides they don’t have a problem with their bowl after all. As much as your pet’s antics and shenanigans may be getting on your nerves and causing more work for you, imagine how they must be feeling. Dogs love food, and placing their dream into a physical manifestation of their worst nightmare must be pretty hard for them to deal with. This is why it’s important to learn why your canine has developed this seemingly sudden aversion to their food bowl, and deal with the problem accordingly. If your dog is afraid of their food bowl, it is your responsibility to find out why and to put a stop to the problem. The most common explanation for a dog being afraid to eat from a plastic bowl is that they experience an allergic reaction when they do so. Dogs can be prone to suffering from allergies to plastic at any point in their life, and the issue may appear to emerge suddenly and without warning. Rubbing of the face and head shaking. Excessive licking and biting of paws. Rashes and infections on the skin, including hives. If you recognize any of these symptoms after they have eaten (or indeed at any other time), make an appointment with a vet for further testing and medication to ease your pet’s discomfort. If your dog does not show any signs of allergy, or their tests come up empty, it may be a case of them being intimidated by the size of their food bowl. If your dog is younger or older, and their appetite is not quite as ravenous as it might be a large bowl – and amount of food to accompany that – can feel intimidating. Maybe your dog has eaten a substantial amount before and felt sick afterward, or perhaps they are worried that they will not be hungry enough to eat everything on offer but will get in trouble if they leave any morsel unmunched. Try a smaller bowl and see if that helps your dog calm down. A dog is more likely to be frightened of their bowl if it is made of steel. There could be a multitude of reasons. A steel bowl could lead to a plethora of distractions, and if there is one thing that a dog does not care for it’s being distracted while eating. Metal feeding bowls can be pretty noisy, and sudden, loud sounds easily spook many dogs. With a metal dish, this could happen when their bowl is placed down on the ground, or when the dish moves while they’re eating. Alternatively, your dog’s collar might clangs against the steel inside their bowl while they are bent over it. No big deal to us, but for your dog and their hugely enhanced sense of hearing, that’ll be akin to listening to church bells chime beside their ears. A stainless steel bowl may mirror your dog’s reflection when they start to get to the bottom of their meal. So what? Well, instinctually your dog may panic at this site, not recognizing it as themselves and worrying that another canine is marching upon them to take their food away. Steel is cold – and that may not appeal to a dog’s sensitivities. Just like many humans are hugely averse to accidentally biting their steel cutlery, or even feeling it, some dogs may be scared by the cold, hard feeling of steel against their nose or tongue while they are tucking into a nice warm meal. Likewise, if your dog has a particularly hairy face or whiskers, they may find a cold, steel bowl to be irritable. “My dog is acting scared and won’t eat!” is a cry that will be familiar to a great many vets. A dog that suddenly loses their appetite can be a very frightening prospect, and it certainly could point to many different health problems. However, there could equally be an altogether more straightforward and less scary explanation. Your dog is worried that you’re going to take their food away! It makes no sense as you were the one that provided the meal in the first place, but Fido’s mind works in mysterious ways. Next time you put your dog’s food bowl down, and they eyeball you suspiciously, give them a reassuring stroke and leave the room. Head somewhere that you can keep an eye open, and wait for your pet to start tucking in. Once they do so, head back into the room without acknowledging your dog in any way and go about your business. Sit on the sofa, read the newspaper, check your phone, switch on the TV, boot up Netflix and watch the episode of Friends where “Joey doesn’t share food!” and wait for your dog to nod in solidarity. Don’t give your pooch any attention or distract them from the task at hand. You may need to always do this when paying your dog’s food down, depending on how hungry your pet is – just because they love you, it doesn’t mean that your dog trusts you when their dinner is stake! After a while, you’ll need to spend less and less time hiding out in another room. Your dog will soon grow indifferent to your presence once they get started on eating, and will only acknowledge you once they have finished and are looking for a dessert treat. Here are a handful of tips that may help your dog overcome any fear of their food bowl, which summarizes what we have discussed elsewhere. Move the bowl somewhere else in the house. Change the size and/or shape of the bowl. Change the material from plastic to steel, or vice versa, and have your dog test for any allergies by a vet. Change your dish soap of choice, preferably to something unscented. Invest in a non-slip mat to prevent the bowl from making noise or sliding around the ground. Check your dog’s gums or teeth for any sign of disease or decay. Remove your dog’s collar while they are eating. 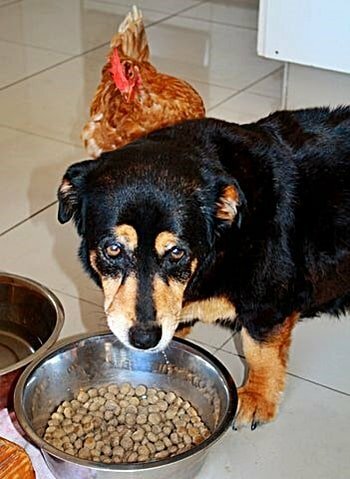 Leave the room when placing your dog’s food down, returning after a minute or two. If your dog’s bowl remains untouched after half an hour, take the food away and bring it back after an hour. Add something tempting to the bowl, such as warm chicken or a small amount of cheese. Never scold your dog for any mealtime behavior, no matter how undesirable you may consider it to be. This will only magnify their fear of feeding. Don’t panic immediately if your dog does display signs of being afraid of their bowl – it happens more often than you may realize. However, if none of these suggestions help, it may be time to consult a professional. There may be something more serious afoot concerning your dog’s health that is causing them to lose their appetite or behave strangely. Why Does My Dog Push His Food Bowl with His Nose? They did it once, possibly as a puppy, and you rushed over to stop them and make a fuss. From that moment forth, it became a habit in the name of attention. They are marking their territory by eating all over the house. They are adjusting the angle at which they are munching from. They are looking for a new, more private part of the house to eat within. They see their reflection in the steel bowl and mistake it for another dog, so they’re trying to get their food away from this infiltrator. This isn’t necessarily a problematic behavior for your dog, provided they are not making a mess all over the house while they move. After all, as long as they are eating it’s a win, right? All the same, if you prefer your dog to remain static while they eat, that is easily achieved. All you’ll need is an anti-slip mat to place their bowl on, or you could even use a tea towel. You may find that your dog gets a little frustrated at first while they attempt to move their bowl as is their habit, but they’ll soon stop trying and get on with it. Why Does My Dog Cover His Food Bowl? If your dog tries to cover their food bowl without eating, pulling a blanket or something else over it, they are engaging in the classic canine instinctive behavior. When a dog does this, it means that they are not hungry at the moment, but survival instinct tells them that they do not know where their next meal is coming from. As a result, they cover the food in an attempt at hiding from anybody else from helping themselves – after all, they might need to return to it later. It’s the same instinct that drives your dog to hide and bury their favorite bones, toys, and treats. It’s best not to encourage this behavior, as it can become a compulsion – especially if it gets attention. If you notice your dog doing this as soon as you lay their bowl down, pick it up again and try again in about an hour. Your pet may have worked up a little more of an appetite by then. Few things can frustrate a dog owner more than their pooch taking a good sniff of their food and then flipping the bowl all over the floor. It’s easy to misinterpret this as disgust at what is being served up, but again this flagrant disregard for table manners is often a matter of primal instinct. Many dogs like to hunt what they eat, and they would never have a meal neatly provided in a bowl while in the wild. As a result, they take great pleasure from tipping their food all over the floor and following the trail all over, sniffing out the tasty morsels and devouring them as they go. Sure, it’s infuriating for you, but Fido doesn’t know any better. It’s not like he clutches a mop or hoover in his paws and cleans up after himself. Of course, it does remain possible that your dog didn’t deliberately flip their food. Maybe they were preparing to eat but got spooked by a sound, sight or sensation and accidentally knocked it over. Alternatively, in some rare cases, it could be a protest against the food in question. If that’s the case, don’t react. Calmly and quietly pick up the dinner, paying your dog no notice as you do so, and give them something else a little while later. The last thing you want is to send a message to your pooch that throwing a bowl flipping fit is the fastest way to get attention and a new meal. Should I Get My Dog an Elevated Bowl? This is a subject that is open to much debate, as PetMD explains in great and fascinating detail. 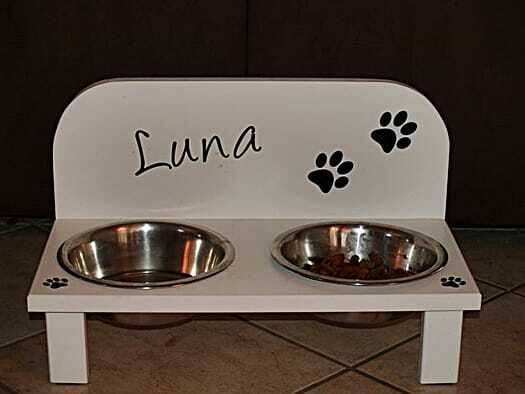 Some experts believe that investing in a raised feeding station for food and water is a good thing for dogs, especially larger breeds, as it ensures that they do not need to bend down to eat and drink. 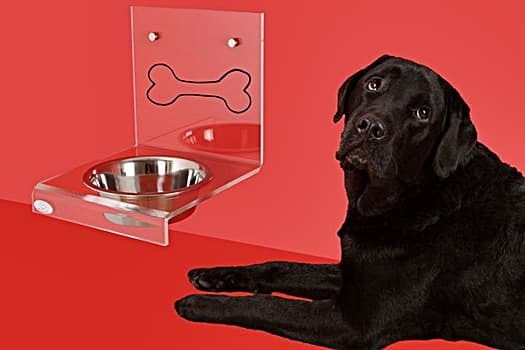 Naturally, this would also prevent your pooch from being able to knock their bowl over, as well as stopping any fearful reactions to ground-based noise. Alas, there is a counterargument that suggests that a dog eating from a raised bowl will not digest their meal appropriately, which can lead to their stomach bloating – a problem that can become fatal to dogs if left untreated. If you do decide to use an elevated feeding station, pick up a specialist bowl designed to slow down your dog’s eating. That should make it easier for their stomach and digestive tract to handle the consumption. A dog barking at their food could be a sign that they are afraid – maybe it’s those loud noises or their reflection in a steel dish, as we discuss elsewhere – or it could merely be playful behavior. Just like when a dog tips the contents of their food bowl all over the floor, we need to remember that a great many dogs still have predatory instincts. They may be barking at the inanimate bowl of kibble, or it may be that there are hunting it before they tuck in. If, however, the barking is in short, sharp bursts and is accompanied by other shifty behaviors, your pet may not be convinced by what you have put down for them. If you have recently changed your dog’s diet, be prepared for a cynical response at first. 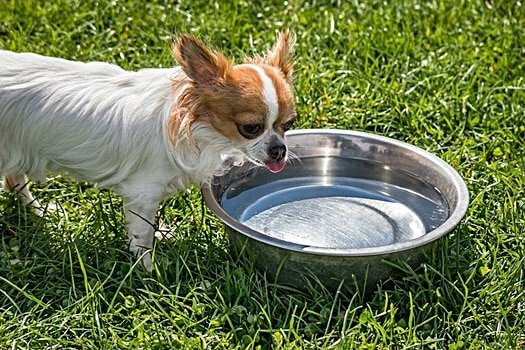 This is arguably considerably more concerning than a pet being afraid of their food bowl, mainly because dehydration in dogs is no picnic – and also because no healthy, right-thinking animal would willingly deprive themselves of water. If your dog seems reluctant to approach their water bowl, offer them some ice cubes to crunch on quench their thirst, to avoid an apocalypse scenario. You should also follow all the advice laid out regarding food bowls, making changes where necessary – but be sure to make an appointment with a vet to be on the safe side. If you have tried all of the solutions listed above and found no success in convincing your dog that their food bowl is nothing to fear, it is worth consulting a vet or behavioral expert. 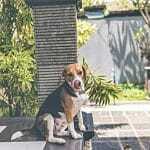 Although our canine companions tend to be excellent at communicating their wants and needs to us, sadly there remains a handful of instances where their inability to speak English means that we need professional help to understand their thought processes. More often than not, however, you will find that a dog’s fear of their food bowl has a wholly rational explanation – or at least, one that is rational to a dog, even if we can’t understand it! 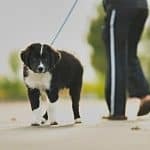 Follow the advice that has been laid out in this guide, and above all, show your pooch plenty of patience and understanding and you should find that problem passes. Why Does My Dog Lay Its Head on My Feet?